Daniel Cormier’s first defense as UFC heavyweight champion went without much in the way of surprise. Dubbed the baddest man on the planet going into his UFC 230 main event, Cormier retained a firm grip on that moniker after making quick work of Derrick Lewis. Daniel Cormier’s first defense as UFC heavyweight champion went without much in the way of surprise. Dubbed the baddest man on the planet going into his UFC 230 main event, Cormier retained a firm grip on that moniker after making quick work of Derrick Lewis. A +450 underdog going in, Lewis never stood a chance. It took Cormier just 2 minutes and 14 seconds to put “The Black Beast” away, serving as — statistically speaking — the easiest victory in the wrestler’s illustrious career. “D.C.” was forced to absorb just four strikes over the course of the fight, needing just four takedowns to showcase his dominance against one of the most feared men in the heavyweight division. But for all his one-punch power, Lewis was, as expected, no match for the champion. It wasn’t even close. Cormier now becomes the first fighter in UFC history to simultaneously defend two divisional titles at the same time, cementing himself as one of the greatest — if not the greatest — fighters of all time. "It's history, baby," Cormier said following his win. ”History in the making -- Daniel Cormier, one of the best of all time! "I think a lot of people have to understand, I've been doing this for nine years. I've fought at the championship level for eight of them. There are no surprises with me. If you have a puncher's chance, that's not enough. You have to be one of the best in the world to even compete.” The champion wasted no time in declaring what was next: a dance with former UFC heavyweight champion and current WWE Universal Champion Brock Lesnar. 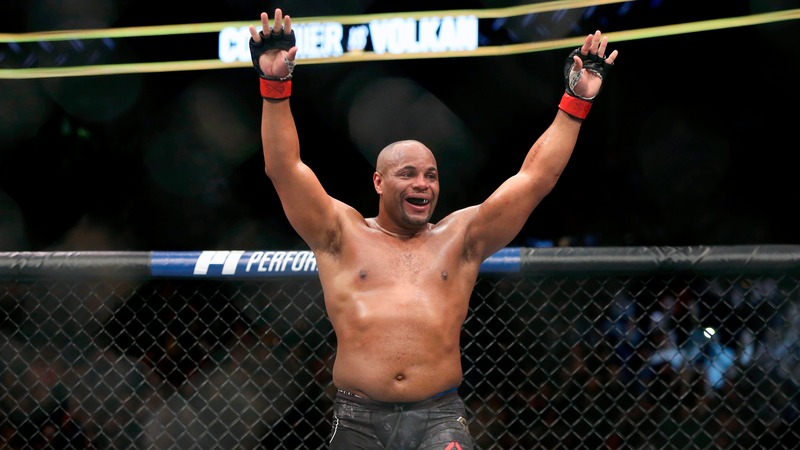 The two were loosely tied to a blockbuster showdown in 2019 shortly after Cormier dethroned former champion Stipe Miocic earlier this year, but “D.C’s” decision to take the Lewis fight, combined with Jon Jones’ scheduled December return, cast some doubt on a potential Cormier vs. Lesnar matchup. Where some believed Cormier would consider pursuing a trilogy bout with Jones, the champion was quick to remind the world exactly where his gaze was focused. "Brock Lesnar, when you come, bring that new WWE title," Cormier said. "I feel like being a WWE champion, too. Let's go, Brock. Bring that belt with you if you come to my house.” Cormier wants Lesnar, and it’s fairly easy to understand why. Bovada listed Cormier as a -275 betting favorite as of Aug. 20, a designation that doesn’t feel entirely representative of just how big of a mismatch Cormier vs. Lesnar could turn out to be come early 2019. Having competed just once in the past seven years, Lesnar, now 41, would be looking to become just the second man to defeat Cormier in MMA, and the first to do so at heavyweight. He’d be looking to accomplish a task that proved too tall for the likes of Antonio Silva, Josh Barnett, Frank Mir, Stipe Miocic and, as of Saturday night, Derrick Lewis. But Lesnar’s slim chances of success would prove futile in deterring the masses from buying in. That, arguably, is the single greatest reason Cormier is taking this bout over any other matchup the UFC could possibly offer him. Though largely considered a star of the previous decade, Lesnar remains one of the most popular fighters currently capable of gracing the Octagon. The WWE star is largely responsible for four of the biggest box office nights in UFC history, regularly bringing in 1 million-plus pay-per-view buys during his time atop the heavyweight division. His return — despite coming directly after a U.S. Anti-Doping Agency-induced layoff — would be largely celebrated as one of the biggest PPV events in UFC history. And with the end of the road already in sight for Cormier, a fight of this financial magnitude is something he simply cannot pass up. The champion would likely stand to earn the greatest payday of his professional career, all while facing an opponent with limited resources to pull off the upset. What’s more, facing Lesnar lines up perfectly with a deadline Cormier set for himself years back. Planning on retiring by his 40th birthday in March 2019, Cormier could welcome Lesnar back into the Octagon in early 2019 before walking off into the sunset in early spring. He wouldn’t need to delay his arbitrary, but personal desire of walking away at 40, cashing out with the most notable fight and victory of his UFC career. That, logistically, couldn’t be the case if Jon Jones made his way back into the picture. Given a reduced suspension from USADA after his second failed drug test in as many years, Jones makes his return to the UFC this December, eager to reclaim the light heavyweight championship he was twice stripped of. Should Jones succeed in defeating Alexander Gustafsson for the 205-pound strap this winter, there’s no telling what the future could hold for Cormier. The current heavyweight and light heavyweight champion has maintained that his interest in a trilogy bout with Jones is mild at best, with Jones also admitting he has little desire to rehash the fairly one-sided rivalry for a third go. But it’s hard not to get the sense that Cormier, listed as +175 underdog against Jones in a potential trilogy (courtesy of Bovada), would prefer one last crack at the only man to ever beat him in professional combat — especially given the circumstances surrounding their rematch. The same could go for Jones (-225), who despite claiming little interest, may actually want to erase all doubt attached to the KO victory that was ultimately soured by a positive drug test last summer. A trilogy with Jones would likely prove to be one of the more financially successful nights in Cormier’s career, possibly enticing the champion enough to delay his scheduled departure from the sport. In a sport with storybook endings existing far and few between, Cormier has a chance to write one of his own.